I hear that several of you sailed Saturday – it looked a perfect day for getting some time in the boat. There’s nothing like time on the water to practice and get a feel for what the boat will do in each condition. Sunday I experimented with my loop (stern) sheeting again. I know it is fast in very light conditions, but I’m pretty sure it is slower when there is a decent breeze. Sunday was a chance to try it with a bit more wind than I normally use it. The result was pretty clear, only when I stopped taking the sheet from the boom, and led it through the centre jammer did I get my usual upwind speed. Downwind remained fast. The start was well captured on Paul’s pictures. From that picture you can see 4859 (Gareth) has the best start with 3385 (Tom) close behind and 5071 (Malcolm) in clear air but some way to leeward. 4173 (Dave L) is in 4859’s backwind, 2042 is being blanketted by both 4859 and 3385, and 3457 (Mervyn) is probably in clear air but directly behind 4859 and 3385 in a reasonable clear air position, but late on the gun. The first beat saw Gareth and Tom exchanging tacks up the middle of the beat while Mervyn tacked off to the right. Malcolm went slightly right and was in the mix with Tom and Gareth. By the first mark it was clear that Mervyn had made the right choice and he quickly established a decent lead while Tom, Malcolm and Gareth fought for the next places. By the second and third lap Gareth had got going and worked through Malcolm and Tom finding some upwind speed to finally catch Mervyn on the second last leg. Tom and Malcolm continued to swap places, first one then the other gaining the initiative. In the end Tom's experience showed and he claimed third. Later in the back to back races there was a rules question – some of the verterans may remember the old ‘mast abeam’ rule – that went out rather a long time ago. The rules are now simpler on windward leeward. Here a case in point – those of you who use the rules quiz will find this as ‘medium’ situation 10. 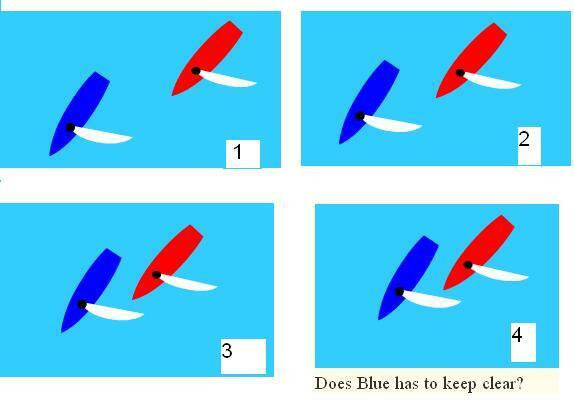 So long as Red does not sail above her proper course Blue must keep clear because blue is the windward boat. Red may not luff, but if she hits blues sail or simply maintains a proper course (her best way to the next mark in the absense of blue) and they converge she has the right of way. If on the other hand red has started to overtake to windward of blue, then blue would have been leeward boat and without any proper course obligation so she could luff, and she could continue to luff provided she gives the windwrad boat a chance to keep clear. (Can’t just turn straight into someone, you have to give them a chance to keep clear but you can luff all the way to head to wind if you really want to – if course it rarely pays to go that far). If you overtake to windwark you need to be very watchful of the leeward boat. Summer is finally here. The Saturday series is up and running, the Wed evening series starts this week, and Tues evening Trysail starts next week. I know Malcolm would love to hear from anyone who can help on Tuesdays, and this is another opportunity for our new sailors to practice (and socialise with this year’s intake).